The founding and early development of this 3,852-acre community at the southeast corner of the Uncompaghre Plateau dates from the 1971 purchase of the land by William R. Wright from Carol M. Hotchkiss. We have interviewed and consulted with a number of people who have generously shared their memories and memorabilia. This information, in addition to our own research, has been used to compile the following story of Log Hill Village (LHV). It should be noted that many people prefer the spelling Loghill Village. 1. George Nelson who, with his wife Mary, bought the sixth house built in LHV in 1978. George is the only one of the early residents who still resides there. In addition to an oral interview with George, he gave us a tape recording that he had made of an auction of Log Hill Crest lots by Western Community Planners executives Bob Draper and Leo Keller in ca. 1981. He also gave us the notebook of information that he kept while leading the effort to construct Firehouse #2 from 1980 to 1982. 2. Bob and Shirley Neel who bought their lot in the Keeler-Hills subdivision of LHM - they built their house there in the late 1980s. In addition to their oral interview, Bob has provided us with numerous maps, a land transaction analysis, and other memorabilia of LHV. They were personal friends of Bob and Louise Draper - Bob Draper was Managing Director of Western Community Planners, Inc., the early developers of LHV. 3. Edgar Hotchkiss, whose grandfather, Uri Hotchkiss, owned most of the land that comprises LHV. Growing-up near Colona, he frequently visited the property with his father George - it was the site where, as a boy, he shot his first buck deer. 4. Frank and Penny Starr who bought their 40-acre lot in Log Hill Crest - they built their house there in the mid-1980s. They were personal friends with Bob and Louise Draper and have been, and continue to be, community activists. They served many years on the Log Hill Volunteer Fire Dept. 5. Sara and Will Coulter, who have resided in LHV since the late 1990s and have been very active in community affairs, including the Homeowners Association. They let us review the archives of the Association. 6. David Mullings, Publisher of the Ouray County Plaindealer and the Ridgway Sun who allowed us unfettered access to the archived volumes of past editions of his newspapers. While we have gleaned considerable information, there are many gaps in our knowledge - we would appreciate learning of additional information in order to more fully document the history of LHV. In the following story, any errors or misinterpretations are our own. It was the dream of Bob Draper (Fig. 1), a businessman from Wisconsin, to come out west and start an area of development. He had been a highly successful CEO of several corporations at various times. He was a candidate for Governor of Wisconsin at one time, but lost in the election. One of his companies manufactured gear shifters for racecars. He drove the pace car at the Indy 500 one year. In the early 1970s, he turned his dream into reality when he invested in a corporation named Western Community Planners (WCP). The land that would become Log Hill Village was purchased by William R. Wright of Denver, CO, from Carol M. Hotchkiss in 1971. Carol was the widow of William Hotchkiss, the youngest son of Uri Hotchkiss. When Uri died in 1950, William inherited the land that had been amassed by Uri which included the LHV property. The Warranty Deed for the property is dated May 3, 1971 - the purchase price was $554,000 (~$144/acre). The deed was notarized July 2, 1971, and filed at the Ouray County Courthouse August 25, 1971. Fig. 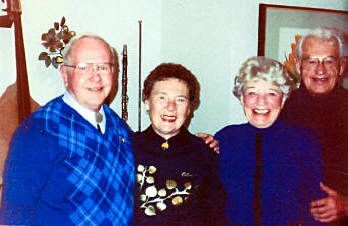 1: Bob and Shirley Neel with Louise and Bob Draper. ca. 1988 Photo courtesy of the Neels. In a Warranty Deed dated October 5, 1972, William R. Wright of the County of Montrose, to the Ouray County Land Co. Ltd., a limited partnership under the law of the State of Colorado, County of Montrose, for $10 and other good and valuable considerations. Signed by William R. Wright. In a Special Warranty Deed dated September 10, 1973, from Ouray County Land Co, Inc. of Montrose, CO, to the First National Bank of Montrose, CO, trustee, for $10 and other good and valuable considerations together with all water and water rights and ditches and ditch rights appertaining thereto. Signed by William R, Wright, Managing General Partner to the Ouray County Land Co., Ltd. In a Warranty Deed dated November 6, 1973, from the First National Bank of Montrose, CO, trustee, of the County of Montrose, CO, to Western Community Planners, Inc., a Colorado corporation. Signed by K. M. Townsend, Senior Vice President of the First National Bank of Montrose, CO. In the January 31, 1974, issue of the Ouray Plaindealer, an editorial by the publisher, Joyce Jorgenson, reports that subdivisions in the County would increase the population by 4,000 and that doesn't take in Bill Wright’s proposal on Log Hill which was once planned for a city of 100,000, but for which the initial phase at least, he is now talking 35,000. In the April 2, 1974, edition of the Montrose Daily Press, it is reported in a lengthy article that the master sketch plan for Grand View, CO, a new self-contained community on Log Hill Mesa has been completed. William R. Wright, Montrose development coordinator, stated that a nearly $5 million project is ready to start on utilities for the site. The plan will be presented to the Ouray County Planning Commission. Wright stated that population at the site will be 1,000 to 2,000 during the first phase and will increase to about 6,000 in eight to 11 years. Included in the planning are hotels, restaurants, two 18-hole golf courses, a medical clinic, a television station, schools, police and fire departments and sanitation. Also included in the plans is a Voice of Youth television program moderated by Wright who is chairman of the board of Voice of Youth. It will emanate from the 80-acre analytics and communications center contiguous to Grand View. President - William R. Wright. He also is the founder and president of Business and Estate Conservation Service and president of Jackson-Keeler-Wright Inc. a Colorado realty firm. Secretary-Treasurer - Robert F. Draper, Vice President of Keith-Stevens, Inc., consultants to management, Minneapolis MN, and founder of Draper Associates, consultant to management. 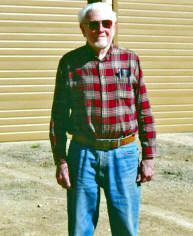 First Vice-President - Leo W. Keller, owner of Pioneer Feed Lot in Oakley, KN, which has a capacity of 35,000 head of cattle. Sixteen additional officers and consultants were listed with addresses in Denver, CO; Grand Junction, CO; New York, NY; Hereford, TX, Montrose, CO; Ridgway, CO, Kremmling, CO. In the September 5, 1974, issue of the Ouray Plaindealer, there's quite a lengthy article with a headline: “Commissioners Approve a Master Plan for Log Hill Development". The agenda included a submission of a preliminary plan for the first phase of Log Hill Village, which is located in the Foothills District contiguous to the Alpine District. The preliminary master plan for PUD development was approved, but each individual phase would have to be submitted for specific approval as plans develop. Bob Draper, President of Western Community Planners (WCP) new management team for the project presented the developers concept and declared their intent to conform to the newly adopted county master plan. He stipulated the 80-acre parcel held in trust for an organization called Free Enterprise Institute Corporation was set aside for 18 months, by which time that organization has to fulfill its obligation or the land will revert to the Log Hill project. He further stipulated that the original planner, Bill Wright, is no longer part of the management team, and his elaborate plans for this	80-acre parcel would never be realized. It was stipulated that this parcel would be used for seminar and or school sites. In the event however, these obligations aren't fulfilled they will be returned to the commission for further approval. Draper stated that a total of 3,852 acres would need to be developed in stages, beginning with the 201 lots, which will be built in a cluster development of single family units. Draper promised to submit a plat plan for this development in the near future. He stressed that the new management team has no high falutin' ideas, and would develop slowly whether or not the 80-acre parcel was redeemed. He anticipated that in the next five years they would have 25 houses built. Draper stated that the existing roads wandered all over the place, and would be abandoned. He did, however, promise the company's full cooperation in providing access to the TV tower, and inferred that they also would cooperate with relocating the tower to provide full coverage to the whole valley. In the Sept 12, 1974, issue of the Ouray Plaindealer, there is a very lengthy article on new WCP plans written by Lee Pickett with the headline: “Officers for Log Hill Development". Robert F. Draper, President of Western Community Planners, announced this week that Free Enterprise Institute Inc. and Grand View are entities of the past, so far as total development of Log Hill Mesa is concerned. He added that he has indeed replaced Bill Wright as head of the project and the new corporation was formed as a result. The recent shakeup in the corporate structure has placed Draper, Thomas L. Bryant, Leo Keller, and Dude Mills, all of Montrose, at the helm of the new company, as President, Secretary/Treasurer, Vice President, and Second Vice President respectively. The article goes on further and talks about WCP. It was formed for the sole purpose of developing Log Hill Mesa in the foothills district north of Ridgway. Other investors in the old company, Free Enterprise Institute Inc. have followed the lead of these officers and severed relations with FEI, but are maintaining an interest in Log Hill development through WCP. The new company has gone along with wishes of the community in conforming to the newly developed County Master Plan, said Ralph Cairns, Ouray County Planner, when asked his opinion of the new plans. The company's plans to conform with the County regulations provide a maximum green belt acreage. The development allows for 201 dwelling units on the first 1005 acres to be developed. That is an average of one dwelling unit per 5 acres. The smallest building site for a single family or cluster town house development will be one acre. Draper stated that: "It is not our intent to sell land and move on, but to make this a permanent home for year-around living. We want the area to be a source of pride for ourselves as well as for others in the County. He added this is not going to be done in the style of the sixties, with hard-sell real estate and hustle. It is our suggestion to those who want the golf-course, country club style of living that they look elsewhere, because we want to preserve the natural beauty of the area". The article goes on to say that the panoramic view of the San Juan Mountains will not be obscured, and for this reason the ragged escarpment which surrounds the entire Mesa and extends far beyond our property is to be left as it is, for a minimum set-back of 200 ft. with the trails left exactly as they are. According to Draper: "There will be one, and only one modification to this very definitive plan to preserve the view of trails. The existent TV towers, according to all information they have gathered to date are adequate for the valley-wide coverage. We plan, for this reason, to build a 45 by 50 ft. glass-enclosed	observation building near the site of the present towers. If feasible, we plan to move the towers to the site where we use the ground level of our gazebo to house equipment and repair facilities for the towers". Draper added: "Material for the pipeline and pumps to pump water from Dallas Creek, more than a mile away and all up hill to the site have been ordered. Obtaining easements from the landowners will take the water lines across the properties and is the next order of business. If all this can be accomplished with the approval of the Commissioners we hope to begin installation of the water system in the fall". The first increment of 1005 acres includes the 80-acre parcel (Lot #1) which is under trust agreement, and on which, according to Draper, development is still unclear at the time. 445 acres are designated as 5-acre parcels. 172 acres are set-aside in the preliminary plan as 2-acre sites. 25 acres for cluster development, and 283 acres dedicated as green open acreage. Included among the additional 2827 rolling acres, which is to be in the second and/or following third and fourth phases of the development, which is now known locally as Cow Camp Meadow, an old development with a history of its own. It is the intent of the LHV developers to restore this area, insofar as practical, using old log structures, and dispensing with recent additions, to add an air of authenticity to the museum-like aura of the place (historically, this was the homestead of "The Greek", John Sofocles). Its setting is ideal for any future special events which need may dictate to the builders and to residents of the future. We have been told that Mr. Draper bought into the LHM venture sight-unseen by someone (probably Mr. Wright) who visited him back in Wisconsin. It wasn't long thereafter that, because a lot of money was being spent, he quit his job and moved here to find out what was going on and to supervise the activity. One large expense reportedly was a total survey of the property at two-foot elevation intervals. "Well, folks, I think we're going to get started, if you'd like to gather around and come up real close, you can't buy all the potato peelers standing way out there. My name's Bob Draper. My wife Louise and I have been residents of Log Hill Village for a little over two years; in fact we were the first folks to live here. We invested in this project exactly ten years ago. It took us about eight years to put all the parcels of land together, go through the environmental statements and all the licensing and the approval of the county and the state; and then before we sold one lot, why we put in almost ten miles of roads, which most of you have seen and are shown on the map. (Fig. 2) We put in over 56,000 feet of water system, and the same in an electrical system. Then after we put the roads in and paid for 'em we gave them to the county, and the county maintains 'em. We have three pumping stations that serve the village. The water comes from Dallas Creek. Our mains range from four inches on the small cul-de-sacs, to ten inches in size. We have a hundred and fifty thousand gallon water storage reservoir. We have fire hydrants at appropriate places. We're part of the Log Hill Fire District, which has two fire trucks; one for structural fires and the other for brush fires. All of our utilities are under ground. We have what is called the Log Hill Village telephone service company, which connects up with Mountain Bell. We have a television relay station on the property, which gives you the Grand Junction station and also services the valley down in Ridgway and the folks over in the Owl Creek area. The Village is very close to the land that is being offered for sale today. And I thought you'd be interested in knowing a little about it. After the sale, if any	of you would like to have a tour we'd be happy to take you around to see some of the homes; and, of course if you're in the mood, we'd even sell you a lot or two! Last year at this time we had four homes in Log Hill Village. Today we have twenty either completed or under construction. People here range in age from two or three years old up to the golden age. Most of the folks here work. There's a number of them that commute to Montrose every day. If you have any questions about the Village or about Log Hill Crest we'd like to answer them before the auction starts, but I'd like to have you hold your questions until Leo Keller has told you about Log Hill Crest, and the terms of the auction by Ron Ball. It's my pleasure now to introduce you to my partner, who is president of our	corporation, and who also lives here in Log Hill Village, Leo Keller." "Thank you, Bob. Ladies and Gentlemen, I'd like to welcome you to our 40-acre tract sale here this afternoon. I see that we have a nice crowd. The reason I say this, we only have 14 tracts for sale, and it looks to me like we have around 40 buyers. Now going into the tract sale we're offering 14 tracts up in Log Hill Crest (Fig. 3). I'm hoping that all you folks have been up there to inspect those tracts. You do have your little maps. I'd like to point out a few things. These tracts are legally surveyed. I'm sure that many of you have been up there and looked those tracts over. I'd like to point out the water availability. If you've got these little maps, you see the cross there around tract seven, and just below tract five, we do have water available from the Village. There's a ten inch water line that lays at tract seven, and an eight inch line there near tract five. I'd like to say this, we do have access roads to each tract. The dark lines that you see there in your little maps are roads that lead you to each tract. Now , in regard to the water, it is available from our company, Western Community Planners, Inc. If you so elect that you desire to hook into our system, it is stubbed off there. It will cost you a thousand dollar water tap fee. Then you leave from there; if you want to go with PVC or if you can join as a group and lay a central water system up there, that of course would be our wish. Also down there near tract two, on that Pinon Street, we do have a 6-inch line there that is only 600 feet from the tract two, approximately 2,000 feet from tract four. Now, Mr. Ron Ball is going to conduct the sale today." The auction proceeded with the sale of the 14 lots at prices ranging from $675 to $1,025 per acre. The lots ranged in size from 37.05 acres to 40.06 acres. Fig. 4 is a recent map of the Log Hill Village complex. While the development has come a long way in the past 40 years, the history has been something of a never-ending soap opera. One management group after another has run into financial strains because they seemingly have been putting more investment into the project that they have gotten out. There have been an almost never-ending series of lawsuits and squabbles amongst various factions of the community. It makes one wonder if the development project might have been more appropriately named "Litigation Village". In 1976, WCP recorded with Ouray County a plat of a Planned Unit Development (PUD) named Loghill Village Unit I to include 220 lots on 1,100 acres. This met the County requirement of an average density of five-acres per lot. The actual lots ranged in size from one-acre to 60-acres. The large lots were for "governmental use", school purposes and an equestrian center. "Greenbelt" areas were designated for hiking trails, equestrian trails and similar uses; but, excluding all entry or travel by	motorized vehicles of all kinds. Protective Covenants for Unit I were filed with the County in June, 1976. These were quite restrictive and have been a source of questions, debates and litigation since then. In 1978, the Loghill Village Water District was formed with Robert F. Draper as President. In 1979, it was reported that Loghill Crest, a project of WCP, comprises 29 tracts ranging in size from 37 acres to 43 acres. This area is fully surveyed and has access roads and utility easements for every lot. A Loghill Village Home Owners Association was organized in 1980 with the purpose of protecting and enhancing the community welfare of its members. Homeowners and lot owners could voluntarily join the association. To this day, the association enforces the covenants with vigor. George Nelson (Fig. 5) was elected to be the first president of the Homeowners Association. He also organized the construction of LHVFD Firehouse No. 2 and served as a firefighter on the Dept. for 10-years. Fig. 5 (left): George Nelson. 2004. Fig. 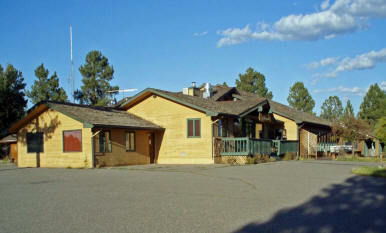 6 (right): LHV Clubhouse. Also in 1981, Robert Draper requested an exemption for a PUD located on 11+ acres south of the main entrance to LHV, just off County Road #1. The units could be duplexes 4-plexes or 6-plexes. This request was not approved. In 1982 WCP sold all real property situated in Ouray County, CO, to Pan American International (PAI). Two tennis courts were built to the west of the headquarters building and the developers said that an indoor swimming pool would be added in about two years and a golf course would be constructed in about three years. In 1984, developers Ronn Mayer and Bob Van Hagge proposed an 18-hole golf course and cluster home development in LHV. They requested a zoning variance from the Ouray Planning Commission for multi-family dwellings at five units per acre for 327 acres. In 1988, a groundbreaking ceremony was held for the new Loghill Village Championship Golf Course which is in part of Unit 3 of the master planned community, and was approved by Ouray County in 1987. In 1991, PAI sold land to Loghill Village Investors Limited (LVIL) - the land being described as lying north of Ponderosa Drive and Canyon and north and west of Juniper Road, LHV Units 1 and 2. The legality of this transaction has been questioned as a violation of Ouray County Land Use Code. In 1992, LVIL sold the above property to Fairway Pines Investors (FPI). This property was described as including greenbelt area - no approval of this action was sought or given by the County Commissioners. In 1993, PAI sold property to Dallas Creek Water Co. (DCWC). This property included the Loghill Village Water System. In 1995, FPI sold property to Fairway Pines Golf Partners (FPGP) which included "Fairway Pines Estates PUD Golf Course, etc." In 1997, LVIL, by Quit Claim Deed to DCWC, gave them certain property rights for water distribution, etc. Also, LVIL by Quit Claim Deed gave the newly formed Loghill Village Park and Recreation District certain lands to be used for park purposes. In 2001, the Dallas Creek Water Co. was granted a permit to build a new water treatment facility to supply up to 400,000 gallons of water per day. That is enough water to accommodate LHV and FP at build-out. In 2004, Ouray County approved the development of LHV Unit 4 lots #12 and #24 for eleven “cluster homes” on each lot. Many current LHV residents expressed disappointment regarding this decision. Also, First National Bank of Telluride took ownership of the original clubhouse on Ponderosa Drive in lieu of foreclosure from Pines Development Group - late in the year the bank sold the property to Par Three LLC. In 2005, about eight miles of asphalt paving of Ponderosa and Canyon Drives was completed. This was a cooperative effort between the Loghill Village Local Improvement District and the Ouray County Road and Bridge Dept. In early 2006, a lawsuit was filed in Ouray District Court complaining that Pines Development Group had defaulted on $6.59 million in loans made by investors, mostly from California. A foreclosure sale of 15 Fairway Pines lots was being scheduled. For several years, Ouray County had been threatening to cancel the PUD for lack of performance by FPGP. In particular, the new clubhouse promised in 1994 had never been built. Later in 2006, the Fairway Pines PUD, including the 15 lots scheduled for foreclosure, was purchased by Equilibrium Resorts after many years of efforts to sell the property by the financially strapped FPGP. The new owners changed the name of the development to Divide Ranch and Club and built the long-awaited, picturesque clubhouse shown in Fig. 7. 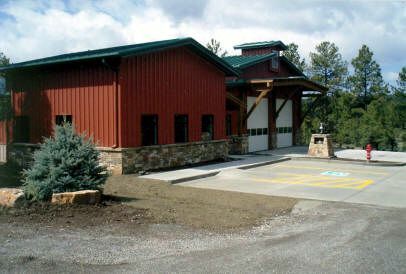 In 2008, the equally long-awaited $1.4 million Headquarters Building of the Log Hill Mesa Fire Protection District was completed. (Fig. 8) It is located just east of Firehouse #2. Fig. 7 Log Hill Village Fire District Headquarters, 2008. Fig. 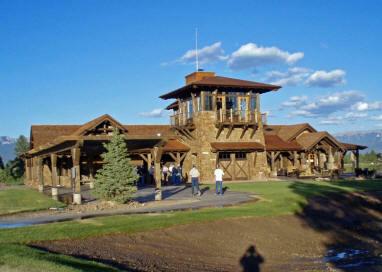 8 Divide Ranch and Club Clubhouse 2008. And so the story of the Log Hill Village Complex development continues. New homes are being constructed in all areas and controversies continue. As of this writing in June 2009, there is heated debate over the construction of an 80-foot tall communications tower on Dallas Water Co. property near the water storage tanks. Also there has been an ongoing legal battle over the membership dues distribution between the old clubhouse owners and Divide Ranch and Club. The boundaries for the Park and Recreation District have been and continue to be disputed. It is expected that the developers will continue to try to add larger houses and multifamily structures on smaller lots in their drive for profitability. Residents will continue to fight for strict adherence to Ouray County laws and regulations and the homeowner associations will bend every effort towards adherence to the legal covenants in order to protect the community that they bought into. In any event, this beautiful area will be an attraction for people and families for generations to come. Current plans allow for about 1,000 residences in the complex. As of the 2000 census for LHV, there were 311 residents, 155 households and 185 housing units. Currently, according to the Assessors Office, there are 369 homes in LHV including Log Hill Crest which represents about 35% of "build-out".